TecFoot has been discontinued by Milford Instruments. TecFoot is an educational Biped Walker designed by David Buckley aimed specifically at the beginner in electronics and robotics. The control-board is ready assembled consequently the kit requires no special knowledge of electronics. The TecFoot kit is easy to assemble using a small screwdriver, a pair of pliers and wood-glue. 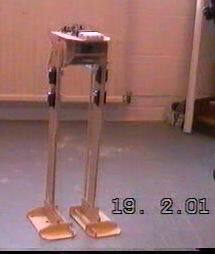 Tecfoot stands about 63 cms or two feet high and has five servos enabling true biped walking and turning. The control processor is a Basic-Stamp2 from Parallax Inc. however the control-board will fit any of the popular 24 pin microcontrollers with the same pin-out as the Stamp2 including all the 24 pin Parallax modules, the BasicX-24 from Netmedia and the Basic-Atom from Basic-Micro. Power for the servos is supplied by four AA cells and power for the electronics by a 9 volt battery. The five servos allow independent control of each foot, each leg and the splay angle between the feet. A simple fully documented Basic program is provided which passes messages to two servo-co-processors which take care of pulsing the five servos. The supplied program operates TecFoot in a static balance walking mode but TecFoot is also capable of operating in a dynamic mode swaying quickly from foot to foot as do humans and other animals, in this mode TecFoot walks much faster and the experimenter may choose to explore this way of walking. TecFoot is available from Milford Instruments.